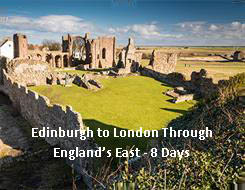 World-famous university cities meet hideaway villages on this tour of Eastern England. We'll travel by river and road, across the stunning North York Moors and the Peak District National Park, following in the footsteps of Vikings, Romans and royalty. Entrance included to: Alnwick Castle and Gardens, Durham Cathedral, Captain Cook Memorial Museum, Blue John Cavern, Cropwell Bishop Creamery, Ripley Castle, Chatsworth House, Sandringham Estate and Newmarket National Stud.